At long last I have found the guts (and the technology) to publish episode two of the podcast. 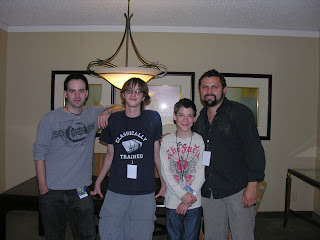 This episode features my hour-long press conference with voice actors Brian Drummond, Aidan Drummond, and Brad Swaile. Since there were only two other news outlets in the room, it was almost like a private interview, which was quite awesome. The other interviewers were the hosts from the Anime Jam Session podcast and two reporters from Montclair University's newspaper. [0:01:06] Introduction for this episode. I give the rundown on the situation, the people, and the audio hiccups contained in this episode. [0:03:32] Press conference begins. The voice actors all introduce themselves. [0:06:25] "Did you go to college, and if you did, what was it for?" [0:08:44] "How did you get your first break into voice acting?" [0:13:54] "Do you have any favorite characters that stick out from everything else?" [0:22:02] "What was the difference between voicing live-action (i.e. the Death Note movie) and voicing anime?" [0:26:04] For Aidan: "What is the hardest role that you've played so far?" [0:27:05] "Is there a difference between playing a hero and a villain, and which would you prefer?" [0:31:47] "What would you say are the major differences between anime voice acting, American animation voice acting (prelay), and live-action or stage acting?" [0:38:48] "Did you think that the 'over nine thousand' and 'potato chip' lines would be as popular as they are now?" In the process of answering, Brian and Brad recite their respective lines in character, as is to be expected. [0:42:16] "If you could play any character from any series, American or anime, who would it be?" [0:47:43] "Brad, you are well known for playing both Quatre in Gundam Wing and Light in Death Note, who are very different characters. Have you found a similarity in these characters that helps you play them both?" [0:49:44] "What do you like to do for fun?" [0:52:05] I ask all three actors to say a line or two in character for a bit of fun at the end. They were great in this regard, giving us some really entertaining lines in the last moments of the interview. [0:53:00] I make some final comments thanking the AnimeNEXT staff and letting you all know about the upcoming shows on the Ani-Gamers Podcast. These include a recording of Greg Ayres' panel on fansubbing and maybe(?) one of Dallas Middaugh's Del Rey panel.